While Morro Bay is known for its beautiful lagoons, hiking trails and outdoor activities such as the Point San Luis Lighthouse, there’s plenty to discover throughout the area. 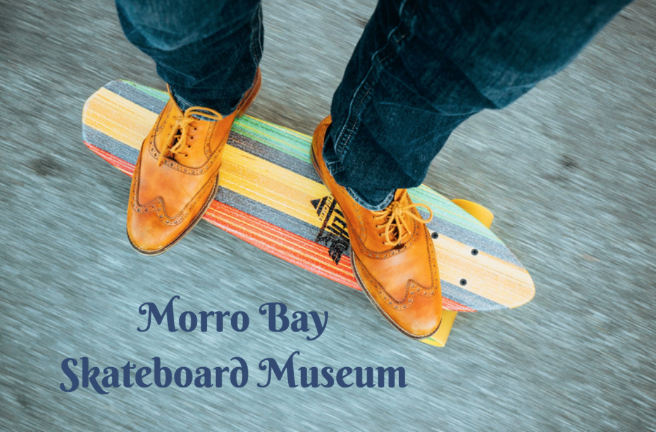 For one option that’s great for kids of all ages, stop by the Morro Bay Skateboard Museum to take a fascinating look into the world of skateboarding history. Whether you used to skateboard or want to learn more, this is a great stop to consider. The Morro Bay Skateboard Museum tracks the history of skateboarding all the way back to the 1930s. As you look through the exhibits, trace the evolution of the skateboard through the 1950s and into the ‘70s and ‘80s when skateboarding exploded in pop-culture. You’ll be able to see all the impressive changes that took place over the years from banana boards and penny boards to the long boards that are excellent for cruising. You can also learn more about the various technologies that took place and the different wheels that helped make tricks on skateboards possible. The museum takes you all the way to current skateboarding technologies, and you can learn about the role that skateboarding plays in pop-culture today. It is truly a fascinating museum and is excellent if you have kids that love to skateboard! You’ll find the Morro Bay Skateboarding Museum located at 699 Embarcadero in Morro Bay. While you are here, grab some merchandise such as t-shirts, sweatshirts, and caps. There are other items as well such as mugs, stickers and educational books. The museum is open from Monday to Friday from 11 am to 5 pm and on Saturdays and Sundays from 10 am to 5 pm. Admission is free to the general public through a $2 donation. If you are looking for an exciting experience during your time in Morro Bay, consider stopping by the Morro Bay Skateboarding Museum and learn something new about skateboards today! Also, please find us if you are looking for lodging in Morro Bay ca.